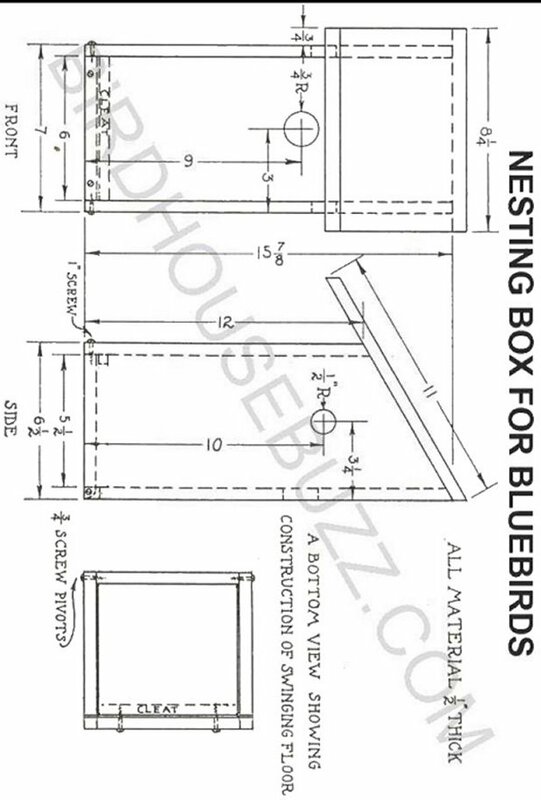 Free plans to build a nesting box for bluebirds. If you're lucky enough to have these brightly colored bluebirds in your neighborhood, building a bluebird-specific birdhouse is a great way to encourage them to make your yard a permanent home. Mainly insect eaters, the bluebird prefers open or semi-open areas with low grasses for foraging. This simple lean-to shed birdhouse design is perfect to nail to a tree or an outbuilding near your home, so you can enjoy watching the adults and the emerging chicks as they enjoy the comforts of your property. Make the nesting box from scraps of wood, following the free blueprints provided. You may wish to add screws to secure the bottom, so you can easily remove it for cleaning when your tenants have moved south for the winter. Bluebirds can be found during the summer months in most of the states east of the Rocky Mountains. They spend winter in the southern states and southward, returning north in March and April. The principal items of food are grasshoppers, caterpillars and beetles. The bluebird should have a house measuring about 5" in length and width, inside measurements, and 8" or more in depth. The entrance hole should be 1-1/2" in diameter and placed near the top, so that the young birds cannot get out until strong enough to have some chance of escape from their enemies after they leave the nest. While authorities differ as to the need of cleaning after a season's use, it seems wise to provide the birdhouse with some device so the bottom may be removed for cleaning.